The black fet100 Series KMS 104 Cardioid Condenser Vocalist Microphone from Neumann has been designed for close range use by instrumental and vocal soloists, and can also be handheld by singers. It offers high acoustic resolution and smooth frequency response (20 Hz to 20 kHz). This mic is also suitable for use with in-ear monitoring systems thanks to the low self-noise and crosstalk behavior. It has a condenser microphone capsule with a cardioid directional characteristic, which suppresses sound originating from behind the microphone. It has a balanced, transformerless output and offers effective protection against pop-sounds. 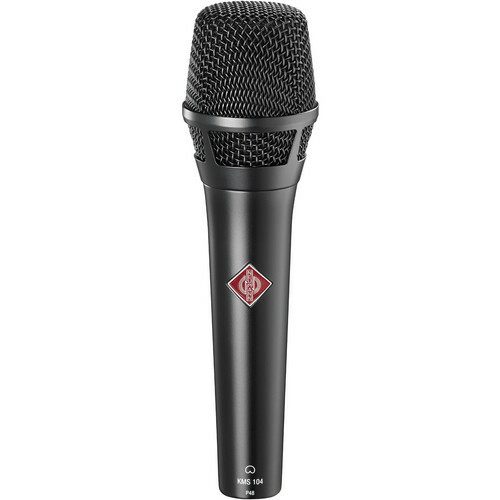 This cardioid microphone offers true sound transduction that is free of coloration. The mic comes with the SG105 Stand Clamp that is designed for vocal microphones. It can be swiveled and has a 5/8"-27 threads in addition to a thread adapter to connect to 1/2" and 3/8" stands (sold separately). A padded nylon bag is also included. Suitable for use for vocal and speech applications on stage, as an announcer's mic for broadcasting/dubbing, in-ear monitoring, etc. Measured as equivalent electrical input signal. Note: According to IEC 60268-1; CCIR-weighting according to CCIR 468-3, quasi peak; A-weighting according to IEC 61672-1, RMS.